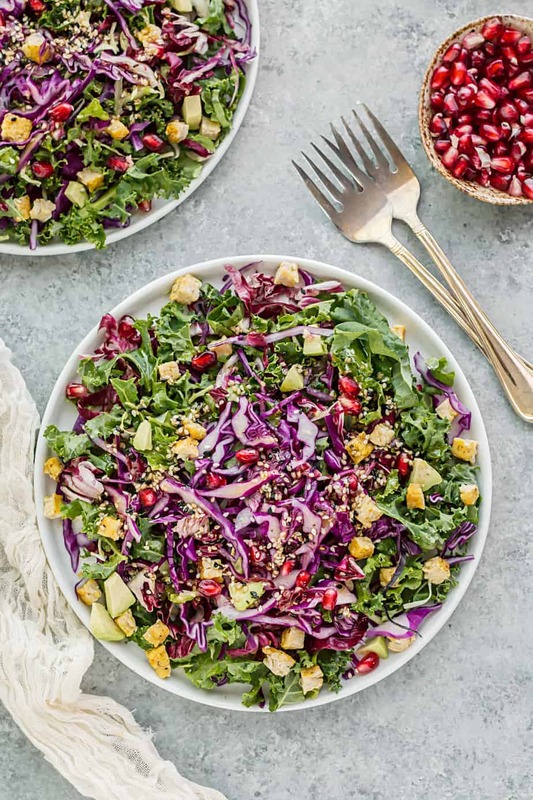 This kale cabbage salad has more health benefits than those you’ll find in a standard iceberg lettuce salad. Cruciferous vegetables like cabbage are very rich in nutrients including vitamins C, K, E, five, carotenoids and glucosinolates. The Glucosinolates are a huge help in fighting off cancer, so I am all about eating as much cabbage, watercress, broccoli, kale and other cruciferous vegetables. Healthy and vibrant salad. Support detoxification and high in vitamin A carotenoids, vitamin C, folic acid. 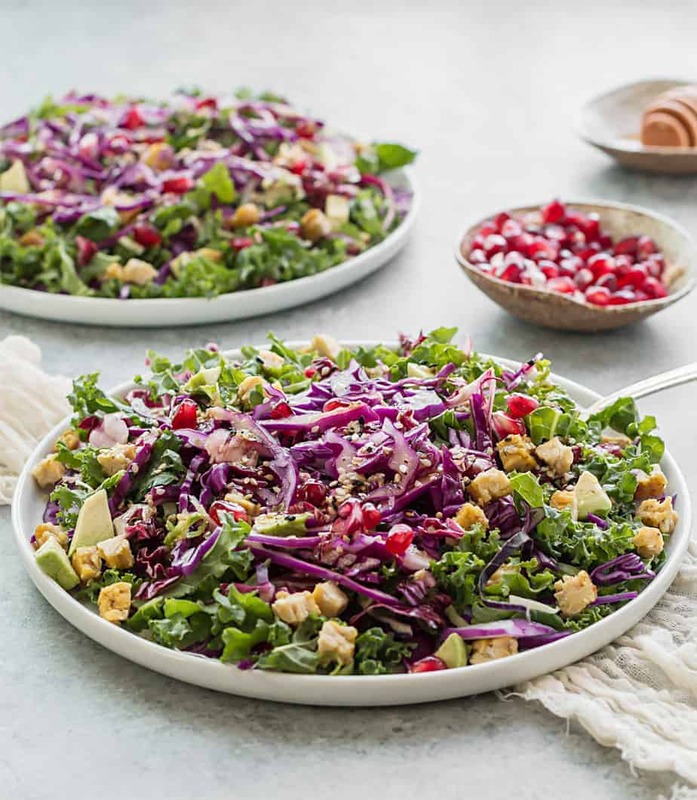 Combine together the fresh kale, cabbages, radicchio, pomegranate, avocado and tempeh in a salad bowl. That sounds incredibly yummy. I love a salad like this that’s full of flavor and packed with vitamins. What a colorful salad! It looks so fresh, I am craving this! That a wonderful looking salad! I love cabbage, and I like to eat it often. I haven’t eaten a lot of Tempah, but I think I’d like to try this! Mmm, this looks terrific… I love the colors! I’m bookmarking this to make this week! This is looks delicious! I’m craving for this one. Bookmarked this recipe. I love kale salad, it is healthy and nutritious and tastes amazing. This dressing looks so good! Now this looks like a great salad!! I have recently gotten into Kale and I need to try this!! This looks so good. I haven’t tried kale. I guess I should, I have heard it is a great superfood. That looks so good. I love the variety of colors. I can’t wait to give this a try. This salad looks so delicious and easy to make. I will have to give this recipe a try this weekend. This looks so good! I love salad and love trying new recipes. I need to try this one! Yum! How delicious!! Wow this looks so good and so simple to make too! I love making salad with leftovers also. Sounds great! I am certain that the dressing really makes this dish since kale can have a strong taste. Paired with sesame dressing, I bet it is delish! Hi Krystal, yes the dressing is key on this one. I eat a lot of cabbage but it can be a bit dry too, so finding the right dressing for this salad was key. I think the pomegranates also helped so the kale and cabbage didn’t overpower the taste. 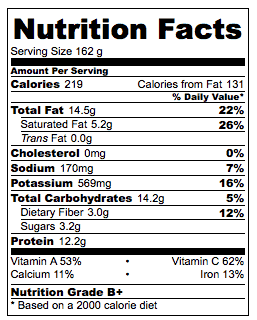 Other fruits would work well too, such as blueberries or apple slices. What a wonderful-looking salad. We had salad two days in a row this week and loved it.